The charming port city of Bergen, Norway is a popular stop for cruise ships working their way up to the Arctic Circle, and the departure point for the world famous Hurtigruten. Once the capital of Norway, Bergen has been a vital center of international trade since the early eleventh century. It's definitely worth a stop on your trip to Scandinavia for the gorgeous scenery and the very family friendly waterfront. 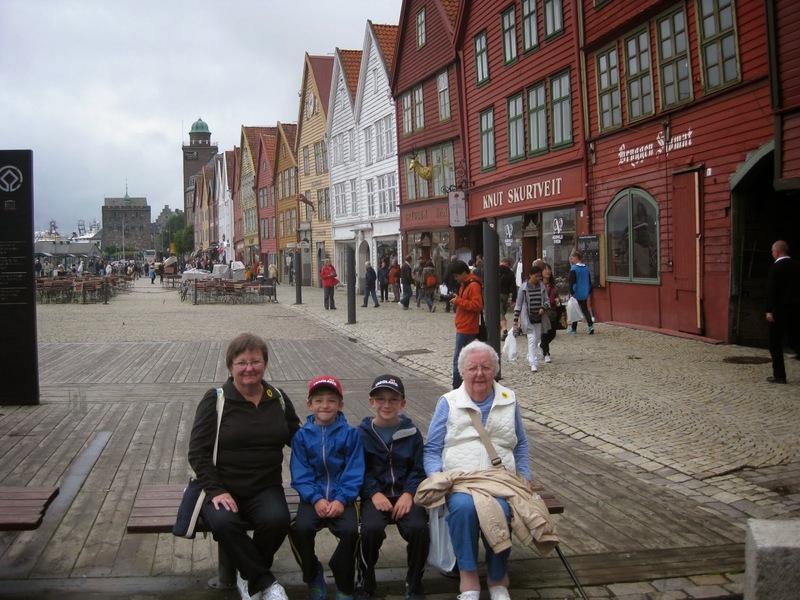 We flew into Bergen from Stockholm to meet up with two cruise shippers, my world traveling Mom and amazing nonagenarian Grandmother. They were on their way from Amsterdam up to the Arctic Circle, so with quite a bit of advance planning we made reservations to meet up for lunch at the classic Norwegian waterfront restaurant Bryggeloftet & Stuene. Centered on the postcard perfect Hanseatic wharf (and UNESCO World Heritage Site), we had a delightful lunch catching up over reindeer filet and whale steak (ok, maybe not but it was the special of the day) before they had to head back to their ship. With a few hours to wander before catching our flight to Oslo, we walked over to the Fløibanen funicular. The quick tram ride brings you to the most spectacular view overlooking Bergen and its busy harbor. 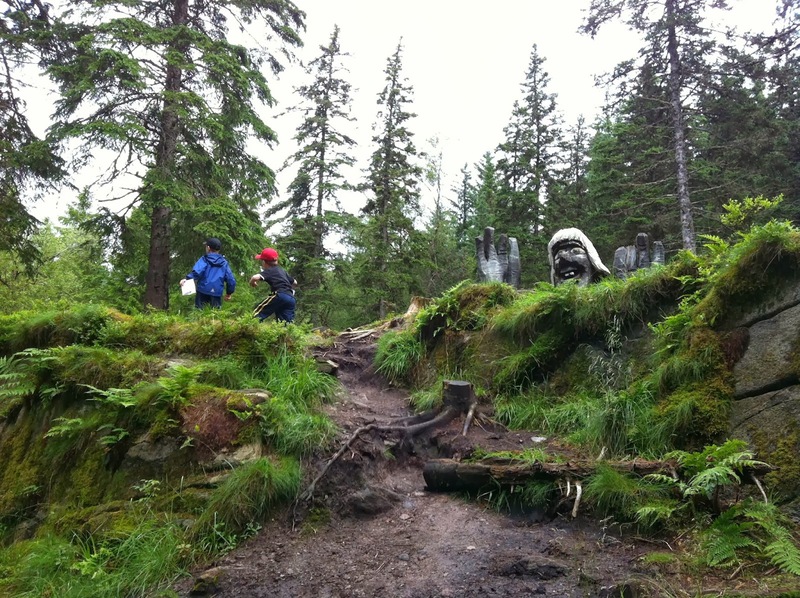 When paying for our tickets we were happily surprised to find they offered a kids scavenger hunt nature trail at the top of Fløyen. Armed with their maps and their search for clues, the little C&Gs lead the way through the giant trees and muddy paths. Clues (in Norwegian and English) were attached to various trees along the trail, and after filling out the answers they were directed to the next clue. The trail takes about an hour and the adventure and the view was amazing. We did get lost a few times, but it wasn't too long before another family appeared and helped us back onto the trail. After rinsing off our muddy shoes in the restaurant bathroom near the Fløibanen station, the boys went off to play on the playground while Mr. C&G and I enjoyed a cup of coffee and a chance to put our feet up. The platform at the top of the Fløibanen offers a spectacular view, along with a gift shop and restaurant. There's a fun playground, jungle gym, and plenty of room for the kiddos to roam in case they have any energy left after your hike. 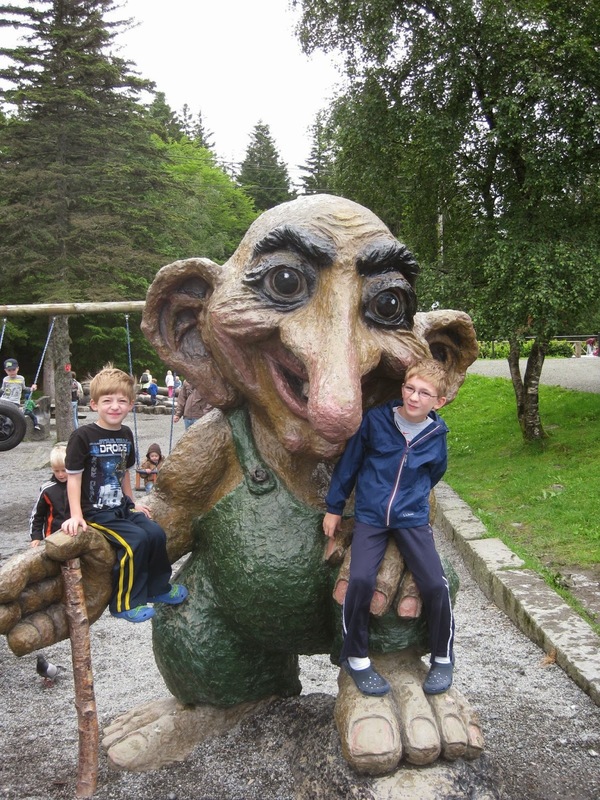 Be sure to stop for a photo with the giant troll before heading back down. We returned to sea level and the boys returned their scavenger hunt maps at the ticket booth for a prize, which turned out to be a nine piece puzzle. Not that exciting, but they had a great time on the hike and it kept them busy and focused. The Fløyen treasure hunt is available from the Fløibanen ticket booth from June 1 through September 30. 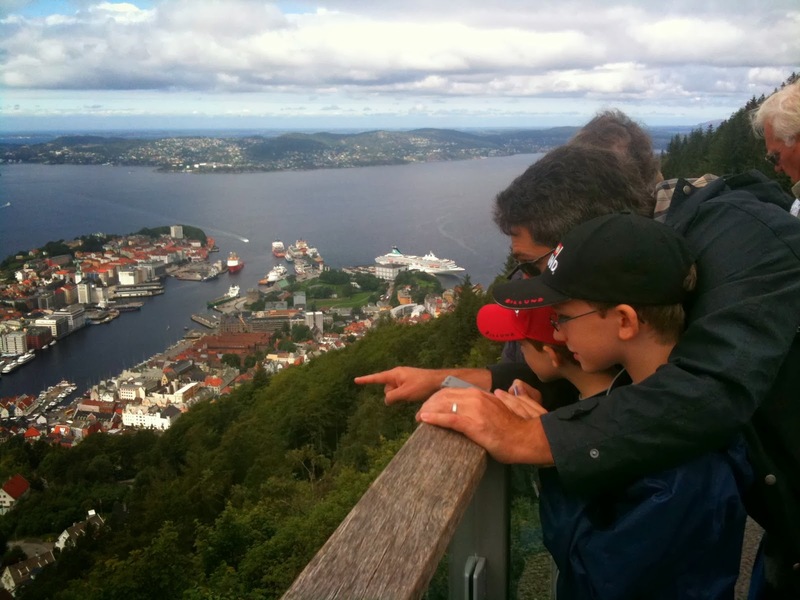 Family tickets for the Fløybanen funicular are 200NOK (about $34US), and there are one way tickets available if you're brave enough to walk all the way up or all the way down the steep path. Although if you value your knees I'd highly recommend taking the tram both ways. Don't be fooled by all the families heading up on foot, most likely they're Scandinavian. Which means they're in much better shape than you are.